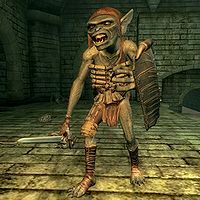 Goblins are violent, primitive humanoids found throughout Tamriel and Akavir, often living in sewers, caves, and ruins in small clan-based societies. They can range in height from three feet to over eight feet. Appearance-wise, goblins have green skin, yellow eyes with slitted pupils, pronounced canine teeth, pointed elven-like ears, and sometimes horns and hunchbacks. Some goblin tribes worship a god called Muluk, who is thought to be related to the Orc god Mauloch, an aspect of Malacath. As goblins are a type of Goblin-ken they are protected and guided by Malacath. Freed goblin slaves were among those responsible for the original founding of Orsinium. Goblins take a traditional view to their outfits, with some pieces even dating back to the First Era. This is called the "Primal" culture set by ethnographers, however, it is unknown if they inherited it from previous generations, looted it from ancient ruins, scavenged it from other civilizations, or forged it themselves. They are known for their vicious combat capabilities with both melee and ranged weapons, although some learn the ways of magic. Goblin society is primitive and violent, and often poses a threat to the more advanced societies that surround them. While their societies are often led by the strongest and largest goblins (called warlords) or their religious leaders (called shamans), some tribes are ruled by other races. Goblin shamans are usually the most intelligent members of a tribe and the ones that lead in religious practices. The death of a shaman is known to turn a tribe docile. The symbol of a shaman's position is often a totem or a headdress; if taken or lost, the tribe will do anything to get it back. Giant Goblins once inhabited Hammerfell before the arrival of the Ra Gada. They were conquered by Divad Hunding, although not entirely exterminated. A Redguard hero named Derik Hallin was famed for fighting back against the Giant Goblins upon their return to the Alik'r. Goblins are also native to the Summerset Isles, and were there when the Aldmer first arrived. Durzogs are reptilian dog-like creatures that goblins raise for war and to hunt down their victims. The goblins of Cyrodiil raise rats in pens for their meat. Goblins usually live in a tribal society, although they are not always part of a named tribe. Those tribes that do have names are notable for their use of symbols, strong leadership, and distinctive traditions. The Bitterfish Tribe was a loosely organized tribe found in the West Weald of Cyrodiil. They use slaughterfish as a food source, and ritually carry their scales. They attempted to take over the Ayleid ruins of Miscarcand in 3E 433, but were driven back by its undead guardians. The Blood Skull Tribe were a goblin tribe found in the Gold Coast. When the Sharp Rock Tribe tricked the Shatter Bone Tribe into attacking the Blood Skulls, they quickly found themselves on a three-sided war with both the Shatter Bone and the Gut Blade Tribe. The Sharp Rock Tribe then allied with the Eye Stick Tribe to conquer those three tribes, but the allies turned on each other at the eve of their victory. Survivors of all the five tribes banded together and formed the Rock Stick and Sharp Stick Tribes. The Bloody Hand Tribe inhabit Cracked Wood Cave in the Nibenay Basin. In 2E 582, the tribe was aggressively encroaching on the settlement of Cropsford, and the villagers feared an attack was imminent. The hostility was evidently too much, as Cropsford was later abandoned. In 3E 433, their totem was stolen by the Rock Biter Tribe, inciting a goblin war. The war ended after a group of settlers got external help to stop the constant raiding parties preventing them from building a farm at Cropsford. The Bonesnap Tribe are found in the Bonesnap Ruins in the Stormhaven region. The Coral-Splitter Tribe are found in the King's Haven Pass in the Summerset Isle. The Coral-Splitter is among the only known tribes on the Summerset Isle, who live in the deepest and loneliest corners of the island. The Coral-Splitter have traditionally lived in King's Haven for quite sometime. Their territory was discovered by scouts of the King of Alinor, who saw the passage as perfect place for an outpost, due to the natural defenses, and the network of caves. Eventually, the early Coral-Splitters traded with the Altmer. As time went on, the High Elves abandoned King's Haven, the Coral-Splitter has lived there since. Because of the Coral-Splitter's aggressive nature, and the perilous cliffs of King's Haven, the pass would be used by the Cult of Phynaster to test the pilgrim's faith. The Cragkin Tribe are found in the Reaper's March region. The Disembowler Tribe was a famous goblin tribe of High Rock. By the end of the Second Era, the tribe had been exterminated. The Dogeater Tribe are found on the island of Stros M'Kai. In 2E 582, a goblin called King Demog took control of the tribe and started causing trouble until he was put down. The Dust Eater Tribe (or Dusteater Tribe) are found in both Hammerfell and Cyrodiil. They are known to inhabit the Dwemer ruins of Rkhardahrk in Craglorn, where they live alongside ogres and dreugh. They also inhabit an abandoned mine known as Barren Mine, found deep in Blackwood. The Eye Stick Tribe were found on the Gold Coast. They battled with the Sharp Rock tribe, but allied with them to conquer the other resident tribes, the Shatter Bones, the Blood Skulls, and the Gut Blades, when these found themselves in a three-sided war. On the eve of their victory, Eye Sticks and Sharp Rocks turned on one another. Survivors of all the five tribes banded together and formed the Rock Stick and Sharp Stick Tribes. The Flint-Tooth Tribe was a tribe of giant goblins that inhabited Hammerfell before the arrival of the Ra Gada. Frandar Hunding rallied the Ra Gada to exterminate the goblins, but was killed during one of the bloodiest battles of the campaign. His son, Divad, rose to take command of the Ra Gada and avenge his father. The goblins, led by their Warchief, were eventually slaughtered, and their spirits became bound to HoonDing's Watch in the Alik'r. These spirits serve to test pilgrims hoping to understand the trials of the Ra Gada, who came to love the desert's simple beauty during their fight against the goblins. The Gnaw-Root Tribe are found in the Shadowfen region of Black Marsh. They were enslaved by the Ebonheart Pact circa 2E 582 to work the iron mines at Mud Tree Village. However, the tribe revolted and briefly took control of the mine. The Pact managed to subdue them by taking their tribal totem and planned to continue using the goblins as slaves, but the local Argonians protested and wanted to release them into the swamp. The ultimate fate of the tribe is unknown. The Gut Blade Tribe were a goblin tribe found in the Gold Coast. Ambushing both the Shatter Bone and the Gut Blade Tribe, they quickly found themselves on a three-sided war. The Sharp Rock Tribe then allied with the Eye Stick Tribe to conquer those three tribes, but the allies turned on each other at the eve of their victory. Survivors of all the five tribes banded together and formed the Rock Stick and Sharp Stick Tribes. The Hillborne Tribe inhabit the cave of Breagha-Fin in Rivenspire. The majority of them were originally Nords who were transformed into goblins by a mage named Malofar using the power of the Emerald Chalice. Malofar was slain and the chalice recovered in 2E 582, and at least one of the Hillborne goblins was restored to human form. The Long Claw Tribe originally from the south of Chorrol. They often battled with the Tooth Rock Tribe for territory, until they were eventually displaced by the local Fighters Guild. Both tribes migrated south into the Gold Coast region, where they banded together slaughtering the resident Rock Stick Tribe. The survivors of the three tribes emerted as the Long Tooth Tribe. The Long Tooth Tribe were found in the southern part of the Gold Coast region during the Second Era. It consisted of the former Long Claw, Tooth Rock, and Rock Stick Tribes. The Murkwater Tribe are found in the Stonefalls region. The Netch Gouger Tribe were a tribe of goblins at home on Vvardenfell during the Second Era. The Ratfarmer Tribe was a goblin tribe of High Rock. By the end of the Second Era however, the tribe has been exterminated. The Rock Biter Tribe inhabit Timberscar Hollow in the Nibenay Basin. In 3E 433, they stole the totem of the Bloody Hand Tribe, inciting a goblin war. The war ended after a group of settlers got external help to stop the constant raiding parties preventing them from building a farm at Cropsford. The Rock Bone Tribe are found in the Gold Coast region. The Rock Stick Tribe was a Goblin Tribe of the Gold Coast region. They formed when the survivors of a complicated tribal war between the Eye Stick, Sharp Rock, Shatter Bones, Blood Skull, and Gut Blade Tribes banded together (a separate group of survivors of that war founded the Sharp Stick Tribe). Later, they were slaughtered by the Long Claw and Tooth Rock Tribes when they migrated into the Gold Coast from near Chorrol. The remaining members of the three tribes were then known as the Long Tooth Tribe. The Rotblood Tribe inhabit Jode's Light, a Khajiiti temple in the Reaper's March region that was abandoned during the Thrassian Plague. The Sandgrubber Tribe inhabit Divad's Chagrin Mine, a shallow mine in the Alik'r. They were originally brought to the abandoned mine by Dunmer slavers, who hoped to sell them as laborers. However, the goblins rose up and killed their captives. Their leader Nokhailaedhaz was killed in 2E 582. The Shadowsilk Tribe are a tribe found in Stonefalls who have managed to tame giant spiders for use as war beasts. An Orc named Oodegu came to earn one of the higher ranking positions in the tribe, killing two of the tribe leaders and giving their shaman "an embarrassing beating" to do so, and lead them halfway across Tamriel to Morrowind. At some point they took control of one of Mephala's Nests, killing the Mephala worshippers within. In 2E 582, a Dunmer mage apprentice named Denthis Romori accidentally transformed his brother Dithis into a female goblin. Dithis was then kidnapped and taken to a nearby goblin camp by the Shadowsilk chieftain Grimmstal, prompting a rescue. The Sharp Stick Tribe was a Goblin Tribe of the Gold Coast region. They formed when the survivors of a complicated tribal war between the Eye Stick, Sharp Rock, Shatter Bones, Blood Skull, and Gut Blade Tribes banded together (a separate group of survivors of that war founded the Rock Stick Tribe). The Sharp Tooth Tribe were found on the Gold Coast. They battled with the Eye Stick tribe, but allied with them to conquer the other resident tribes, the Shatter Bones, the Blood Skulls, and the Gut Blades, when these found themselves in a three-sided war. On the eve of their victory, Sharp Rocks and Eye Sticks turned on one another. Survivors of all the five tribes banded together and formed the Rock Stick and Sharp Stick Tribes. The Sharp Tooth Tribe inhabit an abandoned mine known as Derelict Mine, found east of Skingrad in the West Weald of Cyrodiil. The tribe is often targeted by goblin hunters. In 3E 433 they stole the totem of the White Skin Tribe, inciting a goblin war. The Shatter Bone Tribe were a goblin tribe found in the Gold Coast. Tricked by the Sharp Rock Tribe into attacking the Blood Skull Tribe, they quickly found themselves on a three-sided war with both the Blood Skull and the Gut Blade Tribe. The Sharp Rock Tribe then allied with the Eye Stick Tribe to conquer those three tribes, but the allies turned on each other at the eve of their victory. Survivors of all the five tribes banded together and formed the Rock Stick and Sharp Stick Tribes. The Skull Breaker Tribe inhabit Wenderbek Cave, found deep in the Nibenay Basin near Drakelowe. The Stonechewer Tribe are a tribe found in both High Rock and Elsweyr. They are known to worship Muluk. The tribe in Elsweyr was wiped out by the Knahaten Flu. The High Rock tribe inhabit Menevia, in central Stormhaven. In 2E 582 the tribe briefly held Cumberland's Watch after their totem was stolen. The Three Feather Tribe (or the Three Feathers Tribe) inhabit an abandoned mine known as Plundered Mine, found east of Bruma in the Jerall Mountains of Cyrodiil. The Throatcutter Tribe was a goblin tribe of High Rock. By the end of the Second Era however, the tribe had been exterminated. The Timberscar Tribe are found in the Niben Basin region. The Toothmaul Tribe are found on Auridon in the Summerset Isles. Originally slaves from the main Summerset Isle, the goblins escaped from captivity and laid claim to a cave they named Toothmaul Gully. They then formed a tribe, led by Chief Koth. In 2E 582, a member of the Veiled Heritance named Nelanya tricked the goblins into signing a contract in a desperate attempt to garner more allies. In return for the ability to recruit tribe members into labor and fighting forces, the Heritance provided the goblins with reserve arms and armor. After discovering the goblin occupation of the gully, the First Auridon Marines broke up the alliance and ensured the tribe's survival for their continued cooperation with the Altmer. The Tooth Rock Tribe originally from the south of Chorrol. They often battled with the Long Claw Tribe for territory, until they were eventually displaced by the local Fighters Guild. Both tribes migrated south into the Gold Coast region, where they banded together slaughtering the resident Rock Stick Tribe. The survivors of the three tribes emerted as the Long Tooth Tribe. The White Skin Tribe inhabit Goblin Jim's Cave, found north of Skingrad in the Imperial Reserve, a long way from civilization. They were led by a Breton man named Goblin Jim, who was accepted into the tribe and became their shaman. In 3E 433 their totem was stolen by the Sharp Tooth Tribe, inciting a goblin war. For game-specific information, see the Arena, Redguard, Tribunal, Oblivion, ESO, and Legends articles. This page was last modified on 29 March 2019, at 22:52.